GB is the Vancouver Engage-Momentum Coordinator at the BC Centre for Excellence in HIV/AIDS. He holds a B.Sc Honours in Biomedical Science and an M.Sc in Human Health and Nutritional Science from the University of Guelph. GB has been supporting HIV/AIDS and LGBTQ health since 2015 as a volunteer with HIV/AIDS Resources & Community Health (ARCH) in Guelph, Ontario. At ARCH, he supported community outreach to at-risk populations around safer and healthy communities, knowledge translation to healthcare service providers regarding mental health needs for MSM patients and was as a facilitator for the Queer Men’s Social Network. 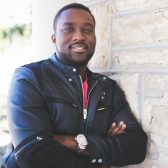 As a Nigerian immigrant with 4 years of experience in international and refugee program coordination he is passionate about health access and equity and hopes to bring a global perspective to Engage.